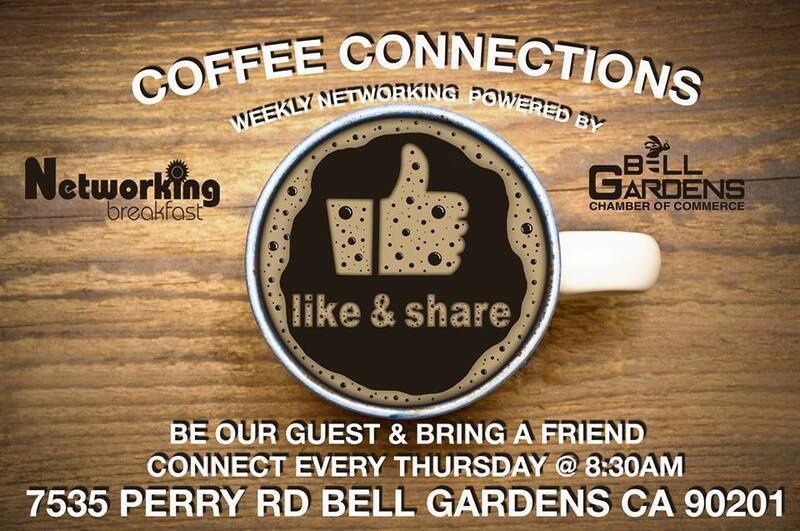 Join us for the Bell Gardens Chamber of Commerce weekly series Coffee Connections. This weekly event will help connect you with many business owners in the Bell Gardens area. There is no cost to attend, we would encourage you to bring a guest. You do not need to be a member to attend, once you see the value what the Bell Gardens Chamber of Commerce brings to the table you will surely want to become one. Bonus: we will be giving every attendee an opportunity to give a 30-second elevator speech about your business does and how it can provide value to a potential client so choose your words wisely. 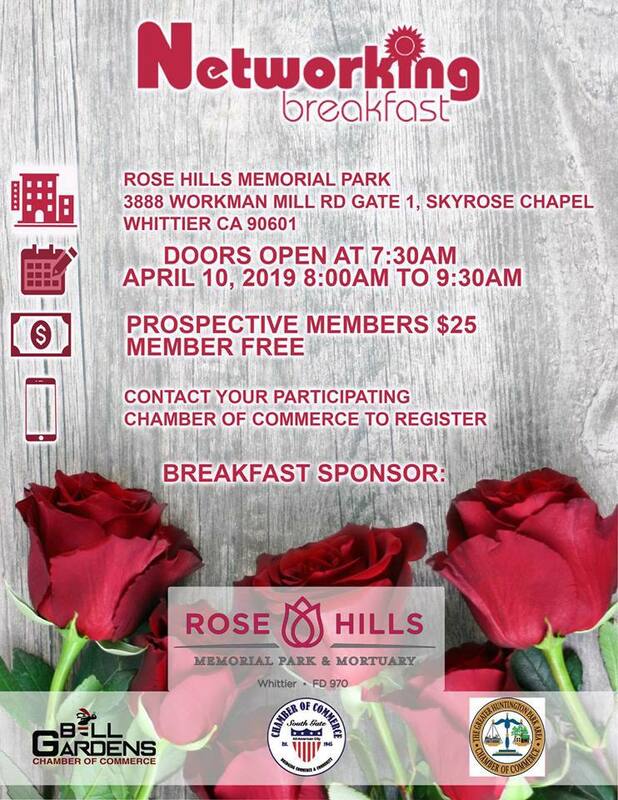 Join the Bell Gardens Chamber of Commerce, South Gate Chamber of Commerce, and the Greater Huntington Park Chamber of Commerce for this month’s Networking Breakfast 3.0. To qualify for the special drawing, you would need to present your ticket during check-in. This will expedite the check-in process and allow our guests more time to network. Each person will receive two tickets for this exclusive drawing. Our monthly networking breakfasts feature over 100 business networkers and are an effective-low cost marketing method for developing sales opportunities. Recommendation and personal introductions are the added advantage, helpful for developing business opportunities. WHY NETWORK, WHY ATTEND THESE BREAKFASTS? The best person to promote YOUR business is YOU! In the professional world, first impressions do matter. They can be the difference between you developing a new client or business lead or just another face in the crowd. Make sure you win them at “Hello” and mark your calendars for April 10th, for our Networking Breakfast 3.0 experience! Come join us early at the start of the day to network, make new contacts, renew old ones and develop new business. Our program includes plentiful of networking, commercials on your business, brand your products and/or services to a large audience, many resources, and business card drawings! Instead of informally mingling with just a few familiar faces, be part of an organized networking environment where each person has the opportunity to speak about his or her business. Then you’ll rotate to another table and do it twice more, meeting tables full of prospective new customers or clients. The advantage of this type of networking is that you have the undivided attention of the group at your table. Instead of informally mingling with just a few familiar faces, you will experience a very focused networking scenario. Come prepared to talk about what you do or sell and bring plenty of business cards. Register now for our monthly Networking Breakfast 3.0 Series and take advantage of this opportunity for structured networking! You are cordially invited to the Grand opening of the newest addition in the Bell Gardens business community. We are proud to introduce Victor Garcia Business owner and staff of the Verizon Wireless store located at 4506 Eastern Ave Suite D Bell Gardens CA 90201. We would encourage our business owners to get to know the staff at this location as well as meet the city council and various elected officials. 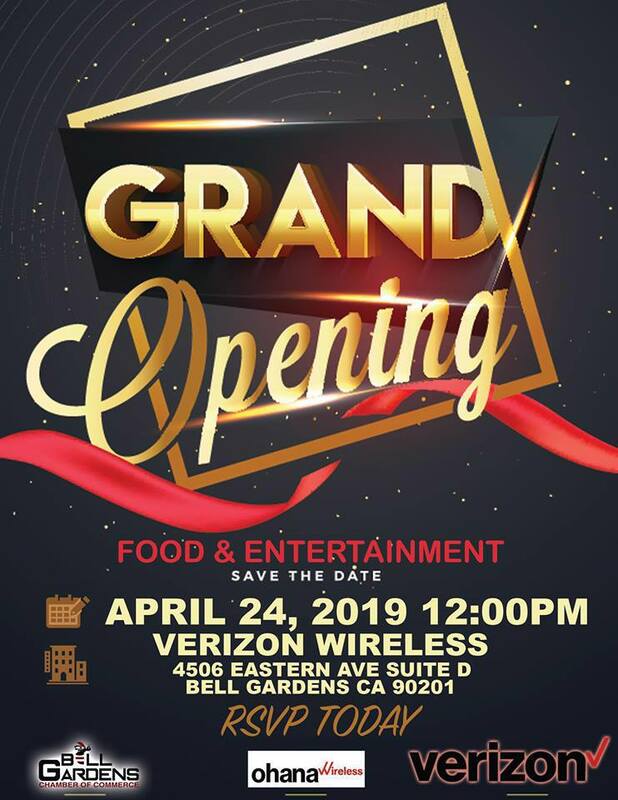 So, mark your calendars and save the date of April 24, 2019, as we welcome our newest member of the Bell Gardens Chamber of Commerce. We will have staff introduce you to the latest in technology to help your business run fast and efficient so make sure that you get there at 12:00 pm. Please send your RSVP on the Eventbrite page so management can prepare accordingly. Bell Gardens Chamber of Commerce is a non-profit 501(c) (6) business association, which promotes the city of Bell Gardens and the business community, provide promotion, advertising, and marketing assistance, provide business training seminars, and provide networking opportunities for the local business community. The Chamber provides opportunities to help business members prosper and succeed through a proactive working partnership with all levels of government and community organizations to achieve a healthy local economy and quality of life. 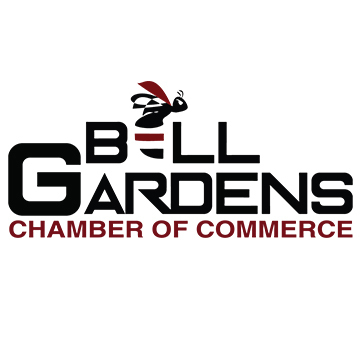 The Chamber contributes to the overall vitality of the business community in the City of Bell Gardens. You are receiving this email because of your relationship with Bell Gardens Chamber Of Commerce. Please reconfirm your interest in receiving emails from us. If you do not wish to receive any more emails, you can unsubscribe here.